Summary: If you're in the market for a Windows tablet able to match the performance of most thin-and-light notebooks, while running completely silent, the Acer Switch 5 SW512-52 is probably the best value option out there. 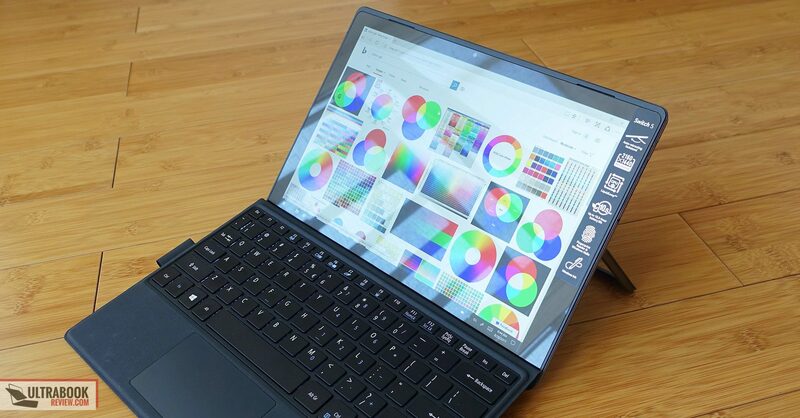 Just make sure you actually want this form factor over a traditional laptop or even a convertible 2-in-1, as its more comfortable to use tablet mode needs to compensate for the smaller battery and reduced functionality as a notebook. 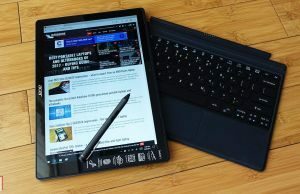 If you’re interested in the Microsoft Surface Pro, you should also check out the product covered in this article, the Acer Switch 5 SW512-52. 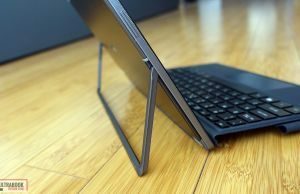 Much like the Surface Pro, this one is a Windows tablet with a similar form-factor, a kick-stand on the back and an attachable keyboard folio. It gets a 12-inch 3:2 IPS touchscreen with pen support and all the components are tucked behind it, inside a nicely built metallic chassis. 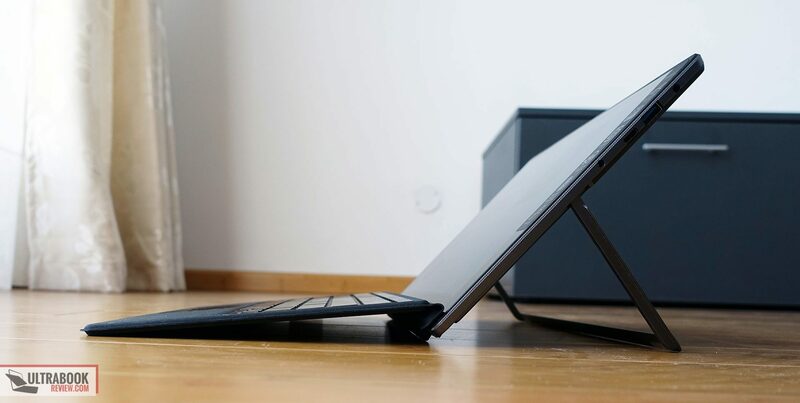 Unlike most other similar 2-in-1s though, Acer puts a passively cooled Core U processor in this device, so the Switch 5 offers the power required to handle everyday activities and multitasking, but without the noise of a spinning fan. 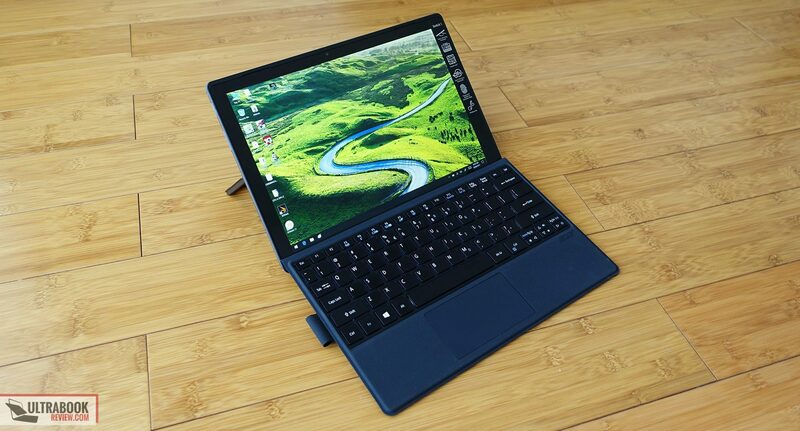 It’s not the only fanless Core U Windows tablet out there, but is nonetheless one of the very few, alongside the Microsoft Surface Pro 5 (Core i5 version only) and the Acer Aspire Switch 12 Alpha. 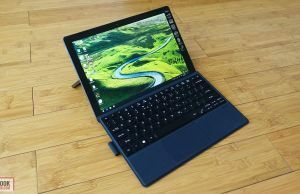 Most other options are fan-cooled, like the Asus Transformer 3 Pro, Lenovo Miix 720, the 2017 HP Spectre X2 or the Dell Latitude 12 2-in-1. The fanless aspect is a significant selling point, and given its much more affordable pricing compared to the Surface, the Switch 5 will attract many eyes. We’ve gathered all our impressions below, with details on its strong points and its shortcomings, so by the end of the the article you’ll know if this is the right device for your needs (or not) and how it fares against the competition. It’s very important to reiterate that the Acer Switch 5 is a mid-range product and thus much cheaper than the Surface Pro 5. 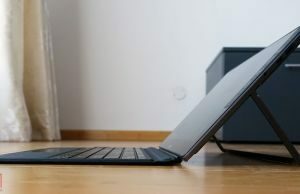 The i5 configuration with 8 GB of RAM and 256 GB SSD is listed at $799 in the US and around 1000 EUR in Europe (the keyboard and pen are included), while a similarly configured Surface sells for $1300 (without the pen and keyboard), while a 2017 HP Spectre X2 goes for $1250 (with the pen and keyboard). I’ve mentioned these two because they are imo the best looking and built devices with this kind of tablet-like form-factor. Back to the Switch 5, it’s by no means poorly crafted or ugly, but it’s not as nice and carefully polished as those other two. 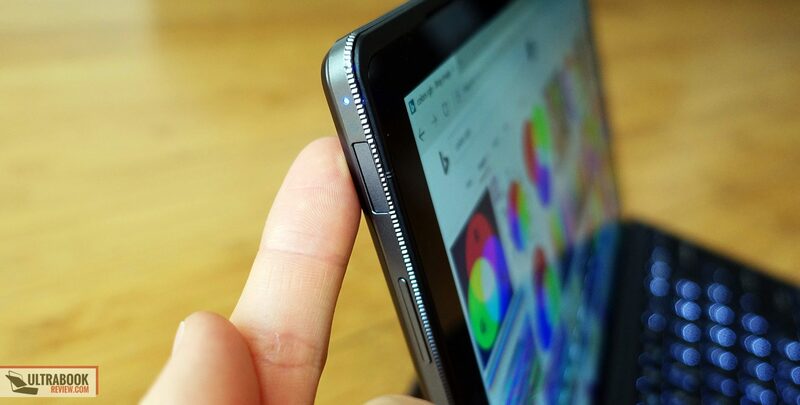 The tablet alone weighs around 2 lbs and its outer case is entirely made out of metal. 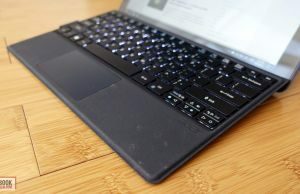 It’s doesn’t bend or squeak when used, and it’s fairly comfortable to hold as well, thanks to the blunt edges and rounded corners. The only questionable aesthetic choice is the serrated edge around the front side, which looks rather cheap imo. It’s a minor detail and I’d expect most to be fine with it. Having a quick look around this Switch, you’ll notice that the back is very simple and only houses a camera, while the front is almost entirely covered in glass and accommodates two narrow speakers grills on the top. All the other buttons and ports are placed around the edges. There’s a volume rocker and power button (with an integrated fingerprint-reader) on the right side, there’s a full-size USB A, an USB-C (gen 1, without Thunderbolt 3) and a headphone jack on the right, alongside the PSU, while on the top lip Acer placed a microSD card-reader flanked by two microphone pins. There are of course no intake and exhaust grills on the sides, as this device is passively cooled. 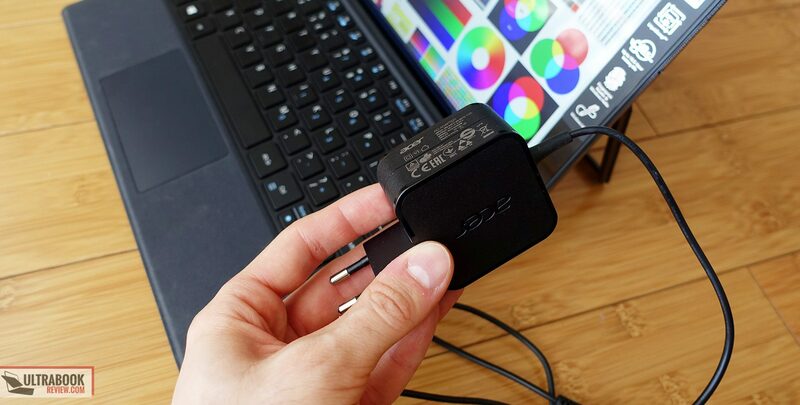 The lack of Thunderbolt 3 might steer some of you away, but the Switch 5 can still hook up to a 4K 60 Hz screen though the USB-C port and, while I haven’t tested it, can also charge via USB-C based on some of the comments I’ve read online. 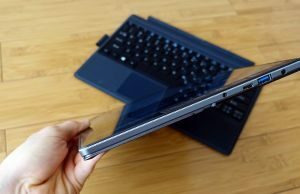 That aside, let’s talk about the kickstand and it’s unusual mechanism, different than what the other OEMs put on their similar computers. 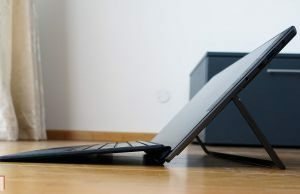 The kickstand is built within the back and stands out a little bit, which actually means the tablet won’t rest entirely on the metallic back when layed down, which should prevent it from scratching, to some extent. The kickstand is a bit stiff though and not that easy to open, as it lacks any creases for the fingers to grab it from, thus your fingertips and nails might suffer. These aren’t its main peculiarity though. 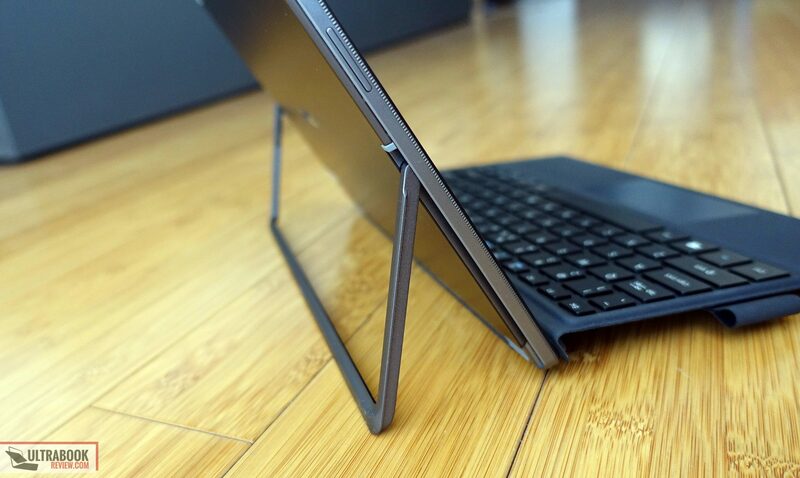 This kickstand opens to a fixed position that keeps the screen at a 110-120 degrees angle. From here on you just have to press on the screen and the kickstand will smoothly slide open to the desired position, but then if you pick up the device it will immediately come back to its aforementioned fixed position. I can live with this approach on a desk, while watching a movie or emulating a laptop, where the device is placed on a fixed surface and I don’t have to move it. Those rubbery feet on the kickstand and actual slate also help with the overall stability on a desk, even if they’re not that grippy. I found the Switch 5 uncomfortable to use on the lap though, where the kickstand constantly pushed the screen back towards its default position even with the slightest of my moves, and I had to continuously press it back to the desired position. As far as using it when leaned on the sofa or in bed, well, I found it pretty much impossible to use this way. There’s are videos on Youtube that better show how this kickstand works. As a tablet the Switch 5 is also fairly nice, even if it’s marginally thicker and bigger than other options. It also gets a marginally smaller screen, which translates in fairly thick bezels, but at least it’s sturdily built. The screen includes a digitizer and pen support, and we’ll talk about them in a further section. 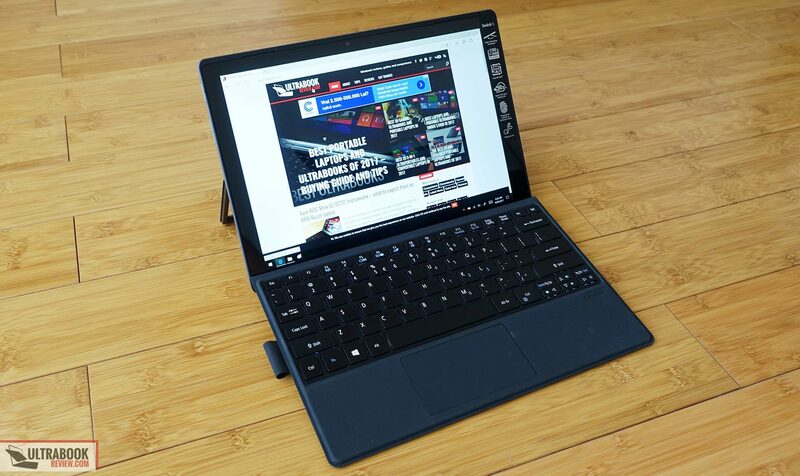 All in all the Switch 5 is a well built and nice looking hybrid and makes for a good laptop and tablet in most scenarios. I’m not a fan of the kickstand’s design though, I much prefer the mechanisms on the Surfaces. 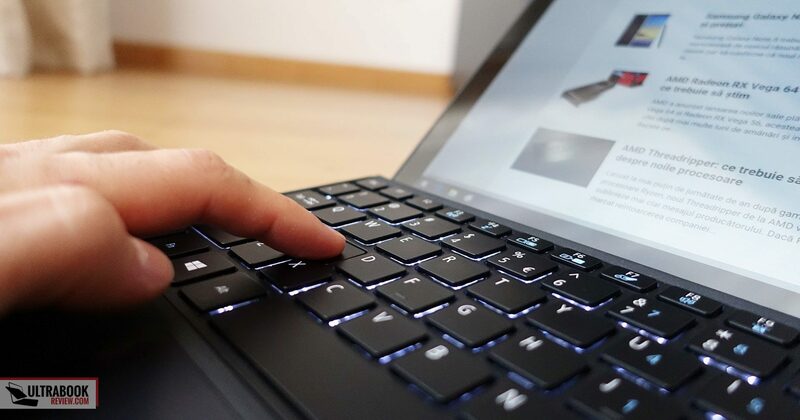 As most other devices with the same form-factor, the Switch 5 gets a keyboard folio. 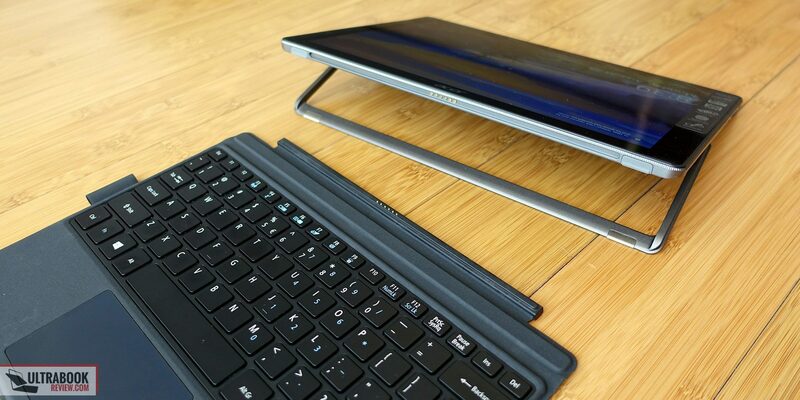 It looks and even feels a lot like the folios on the Microsoft Surface Pros and Asus Transformer Pros, with a felt-like finishing and plastic inner chassis. 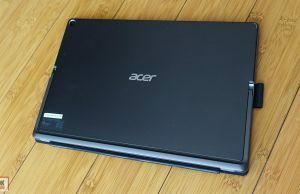 Our unit came in gray and I’m not sure if Acer plans to offer it in other colors as well. The felt finishing feels alright to the touch, but I can’t tell how it’s going to age and whether it will wear-off after a while. 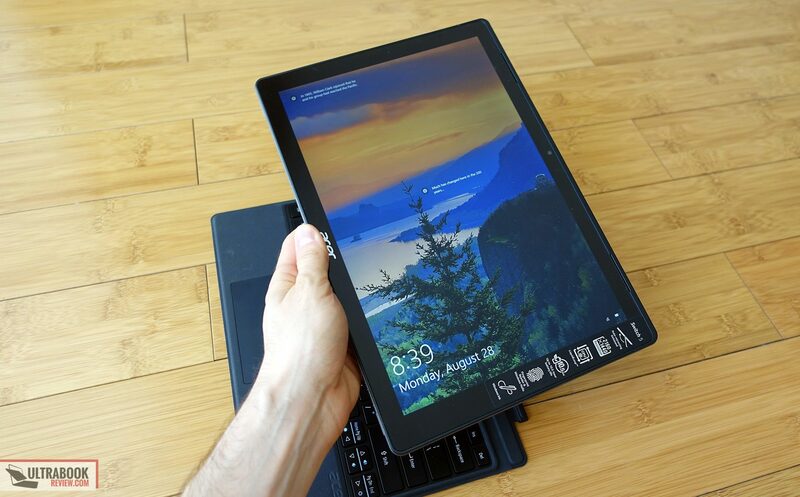 The keyboard attaches magnetically to the tablet and only works while hooked up, as it’s powered by the slate itself. It can be set-up in two positions, completely flat on the desk or slightly raised, for a slightly inclined and more ergonomic typing position. Both are standard options on all the existing detachables with keyboard-folios. The folio is made out of plastic and is also fairly thin and light, so there’s no surprise it flexes a bit in the raised position. 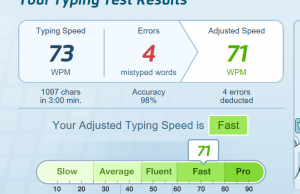 Despite this, the typing experience is surprisingly good. The keys have the right response and feedback, even when pressed on the sides, and there’s none of that spongy feedback I’ve encountered on the older Alpha 12. 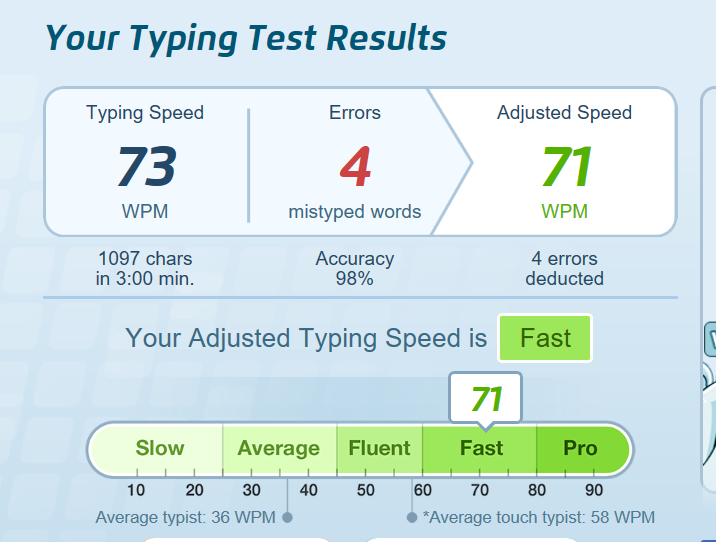 This is still a short stroke keyboard and not the fastest to type on either, but for me it proved to be one of the most accurate I’ve got to try lately. 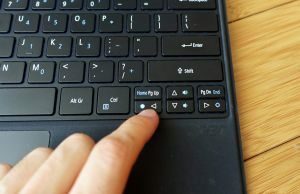 The keyboard is also backlit, but the keys only light up when pressed and not while swiping fingers over the clickpad. 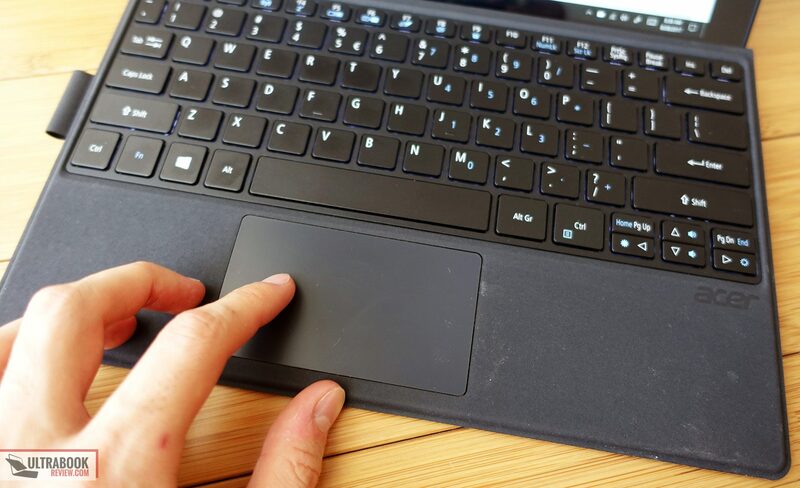 Speaking of it, the clickpad is rather small and made out of plastic. 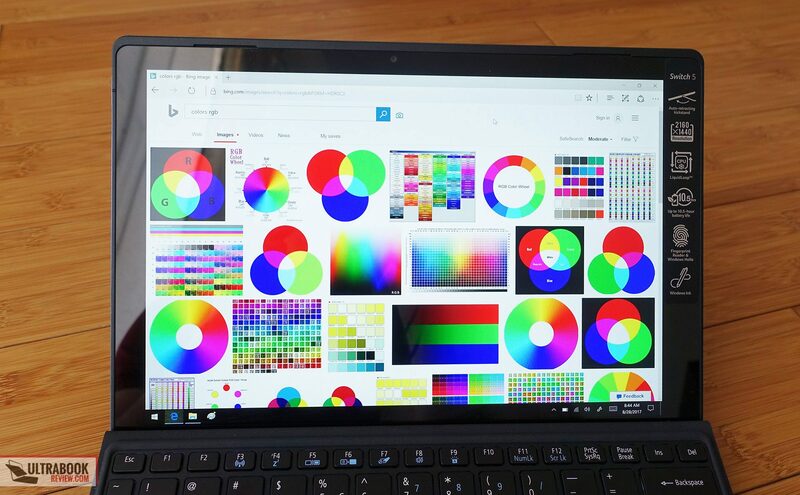 It is however a Microsoft Precision surface and works fairly well out of the box. 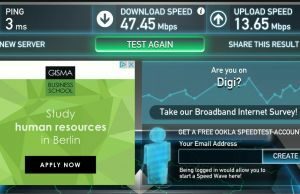 I found it a tad slow for my liking, which can be addressed from the settings, and I’d say that its responsiveness with very precise swipes could also be improved, but these aside I have nothing to complain about. 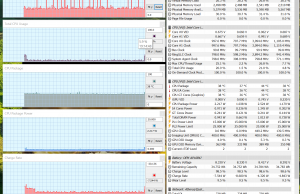 I also didn’t run into any issues or noticed any quirks during my time with the computer. The Switch 5’s physical Power Button also doubles as a finger-sensor, and works alright with Windows Hello. It doesn’t always register the print from the first try though, so the experience of logging in is not as seamless as on other devices with finger-sensors. I’ve read a few other reviews of this Switch 5 and all of them critique its screen. Yes, it’s not as bright, as uniform, as color accurate or even as sharp as the panel you’ll get on the Surface Pro 5, but I fell that it’s not that bad either. 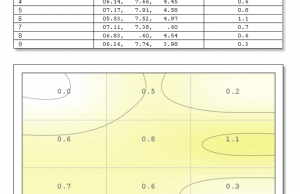 Black on max brightness: 0.50 cd/m2. 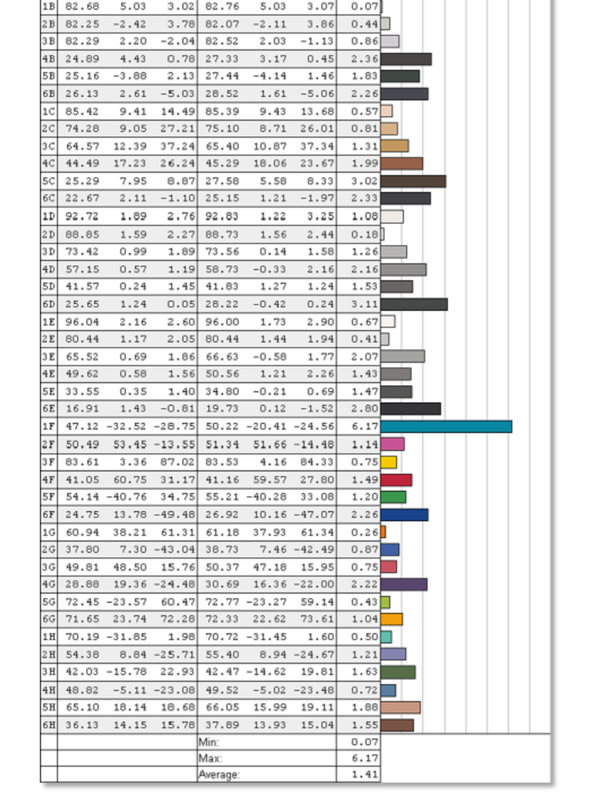 The colors are nor very accurate, nor that skewed either. 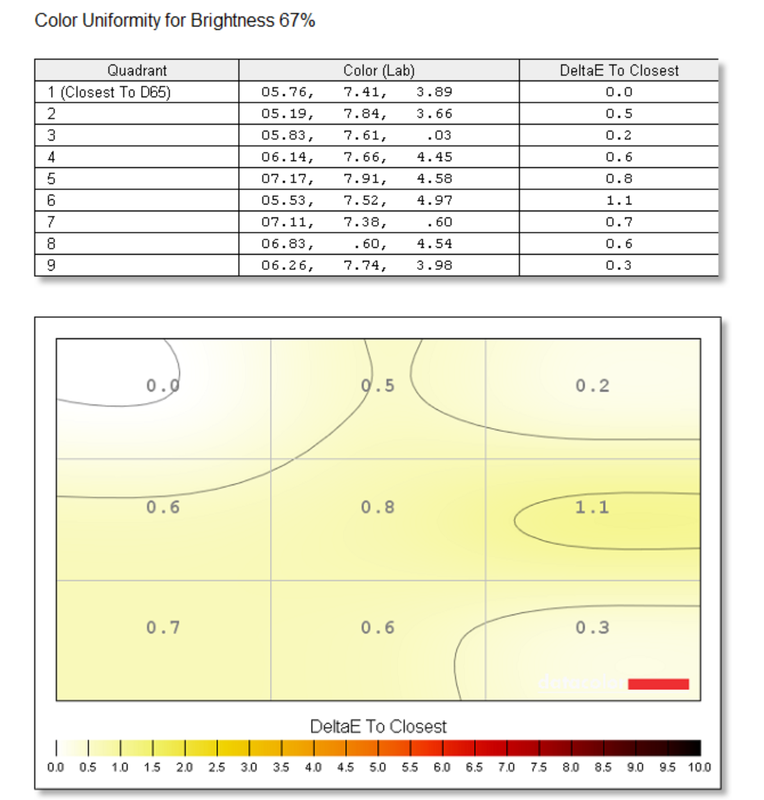 Unfortunately our calibration didn’t seem to do much in terms of DeltaE correction, but can help normalize the gamma and white point skewages. You can find it here if you want to give it a try. 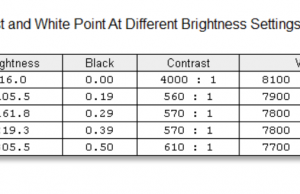 I didn’t get any obvious light bleeding on my sample, but I’ve read some complains in other reviews, so you should be aware that uniformity can be a matter of luck with this device. 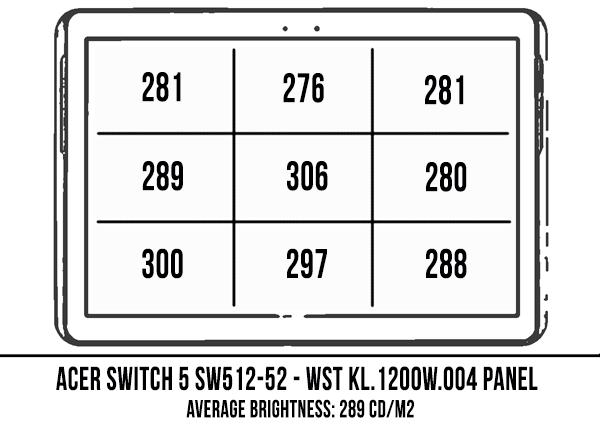 All in all, yes, you can get much better screens on other tablets out there, but given the Switch 5’s mid-level price, I’d say most of you should be fine with the panel Acer chose for this computer, as long as you don’t draw a short stick at the panel lottery and end up with bright spots or light bleeding. Make sure to buy from a place that handles returns well, just in case. 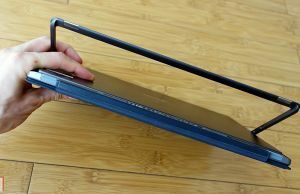 This screen includes a digitizer (made by ELAN, from what I can tell) as well and supports Acer improved Active Pen with 1024 levels of pressure sensitivity. It’s a powered pen that works with an AAAA battery and is included with the Switch 5. It’s not the same pen Acer bundled with the older Switch 12 Alpha, and as far as I can tell (and other reviewers confirm it too) it works smoother than the older model. This pen feels nice in the hand and it’s light, well, as light as an active pen can be. 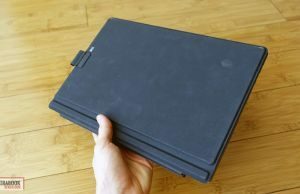 You can hook it to a dedicated loop on the keyboard folio when not used, but there’s no way to store it inside the actual slate. My experience with pens is rather limited, as I don’t use them on a daily basis, but I found this one alright for sketching and decent for taking notes. 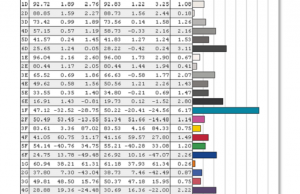 Tracking can be improved, as I feel it could be quicker and more precise, but palm-rejection worked fine. 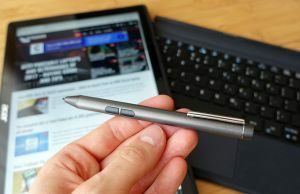 Make sure to read other impressions as well, I’m not a go-to when it comes to pens and perhaps you can find opinions from people who actually take notes on a touchscreen on a daily basis. 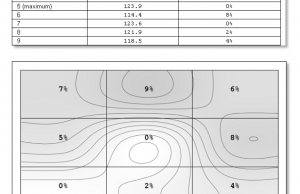 I will also add that the pen on the Surface Pro 5 feels more accurate and handles 4096 pressure points, and even with the NTrig digitizer on the latest Surfaces, the inking and drawing experience they provide is superior. 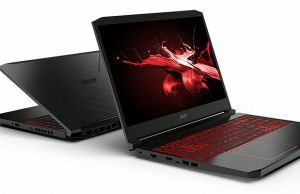 Acer sells the Switch 5 with either a Core i5-7200U or a Core i7-7500U processor, 8 GB of LPPD3 memory and an option for a 256 GB or a 512 GB SSD. 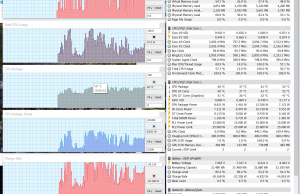 We got to test the base Core i5 model which offers the better value for the money imo. 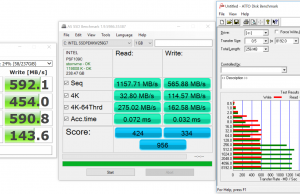 It came with a fairly fast Intel SSDPEKKW256G7 PCIe x4 SSD that it better than I would have expected for the mid-tier segment where this Switch 5 competes. 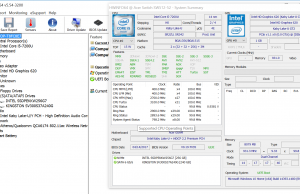 I suggest buying the configuration you need from the beginning, as getting inside this computer is more complicated than with a traditional laptop and most of the components are soldered. I didn’t open my sample, but the SSD should be replaceable with a compatible M.2 80 mm drive in case you want to put a bigger one inside. Take this with a grain of salt though, I can’t confirm for sure it is replaceable since I didn’t get inside. 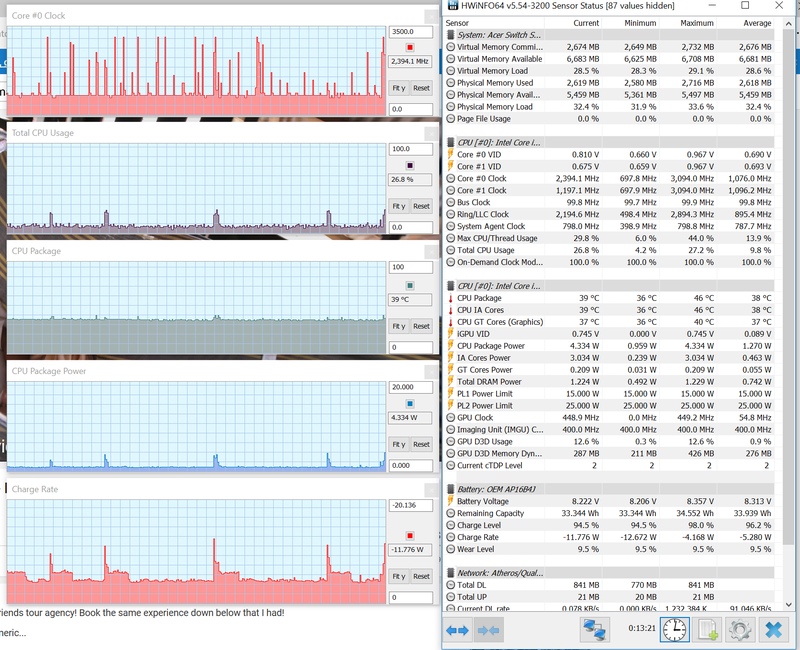 The dual-core i5-7200U processor is fast enough for everyday use (browsing, movies, music, texts, etc) and can handle multitasking well. 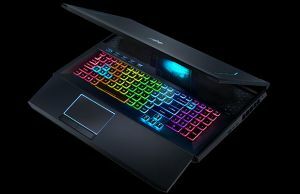 It can also deal with more complex loads, like editing an image in Photoshop or perhaps playing a light game that can be handled by integrated Intel HD 620 graphics chip. However, let’s not forget this is a tablet with passive cooling, so it should come to no surprise that it can’t get the absolute best out the included hardware. It’s very close though. 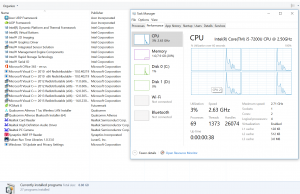 The CPU runs perfectly fine with most daily tasks, without overheating or having any troubles in reaching its maximum Turbo Boost speeds. Details in the pictures below. 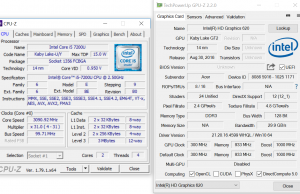 It runs fairly well in benchmarks too, with only slight drops of 100-200 MHz of its Turbo Speeds noticeable with Cinebench (which puts a 100% load on the cores), that I’d expect could be corrected with undervolting. 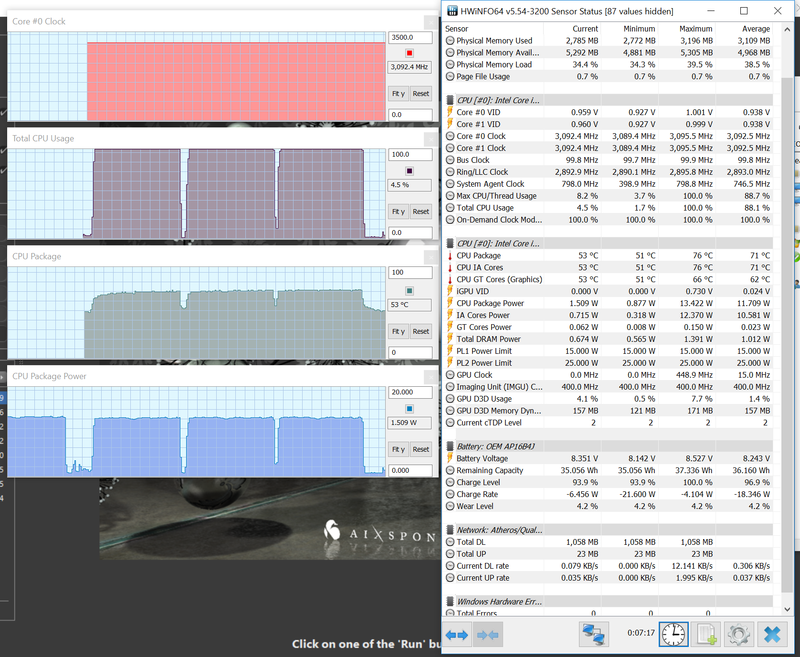 I even ran Cinebench in a loop without noticing a change in behavior, so overall this Switch 5 performs much better than the passively cooled Surface Pro 5, whose performance drops significantly in similar continuous loads (source). 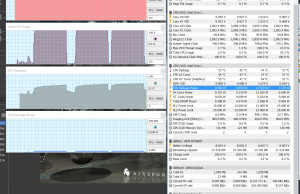 Performance with games is limited though, as Acer had to force the CPU to clock down in order to allow enough power for the GPU, while keeping temperatures at bay. 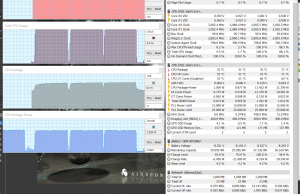 The pictures below show that the CPU’s package reaches temperatures of around 70 Celsius while running games, which is much lower than its TMax of up to 100 degrees, but the performance degrades with time as the computer heats-up. 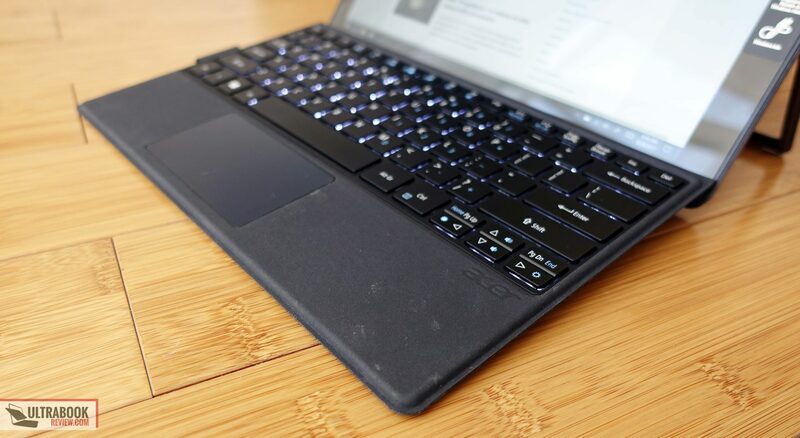 The heat spreads much easier to the components and case with this kind of fanless design and thin build, which is the main reason Acer were forced to limit the frequencies in order to keep temperatures at bay. 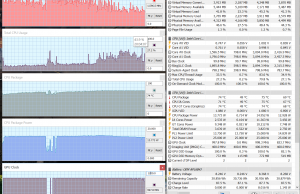 Even so, this computer gets very hot under load, as you’ll see in the next section. 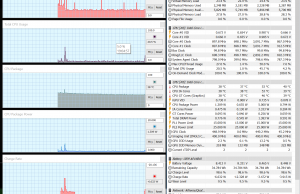 We ran some benchmarks as well, if you’re interested in the physical numbers. 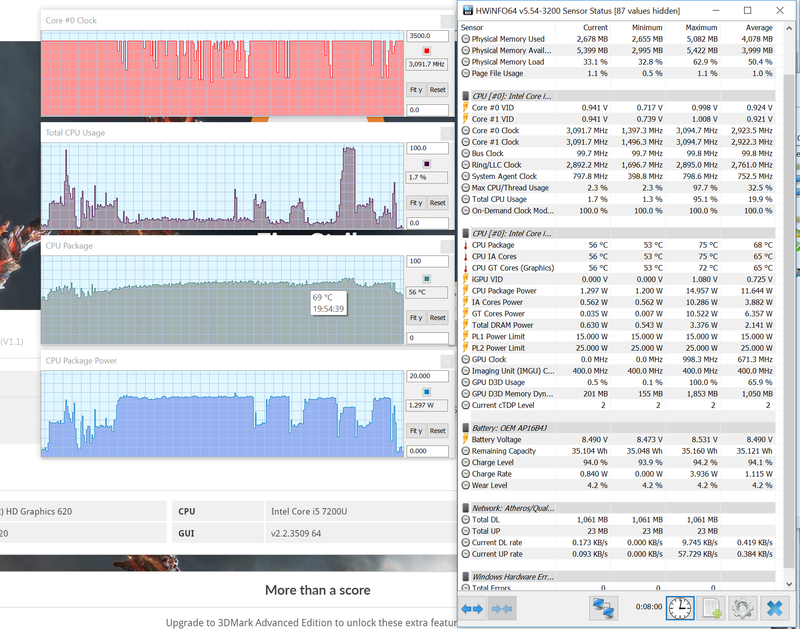 x264 HD Benchmark 4.0 32-bit: Pass 1 – 112.41 fps, Pass 2 – 21.47 fps. 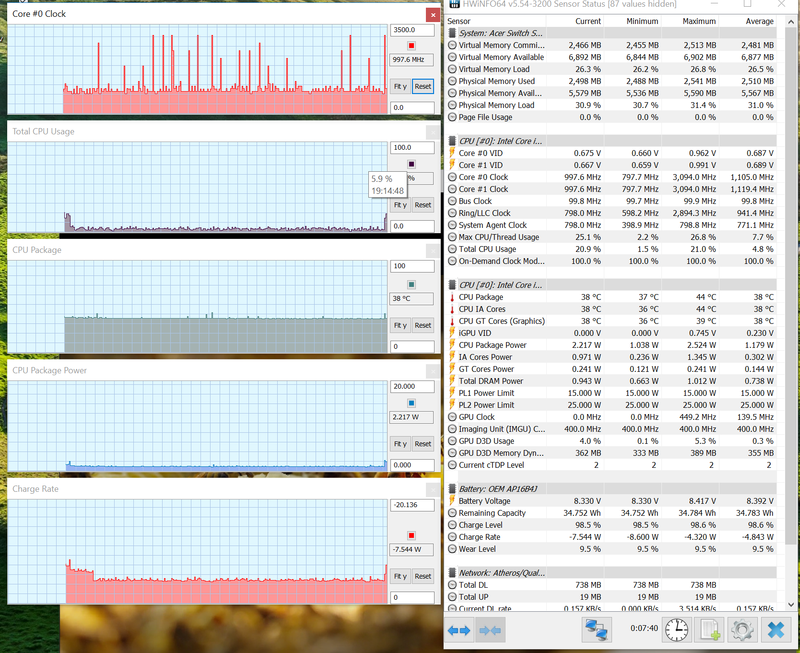 All in all this Switch 5 performs better than I was expecting from a Core U passively cooled tablet. 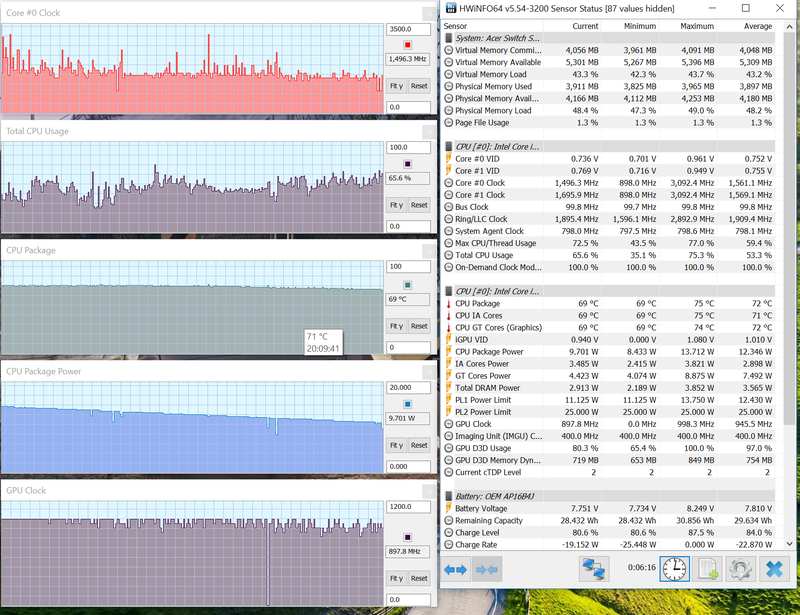 In fact, it performs betters than many fan cooled ultraportables. 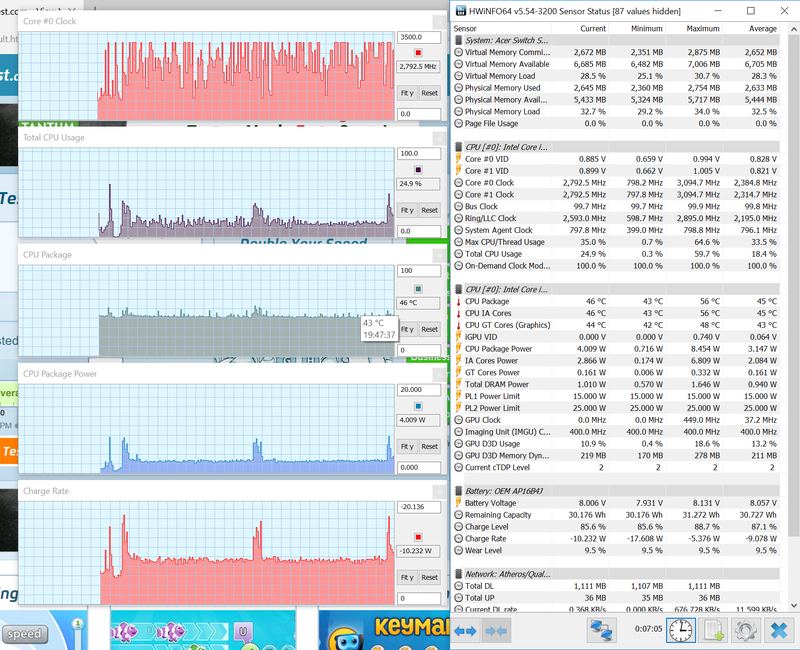 It handles standard chores fine and it should tackle more intense CPU loads alright as well. 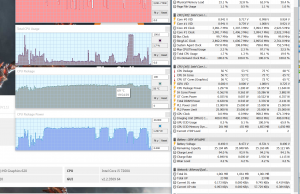 It’s not a computer that you should get for heavy loads or for games though, that’s why I wouldn’t recommend going for the Core i7 configurations hoping for extra performance. 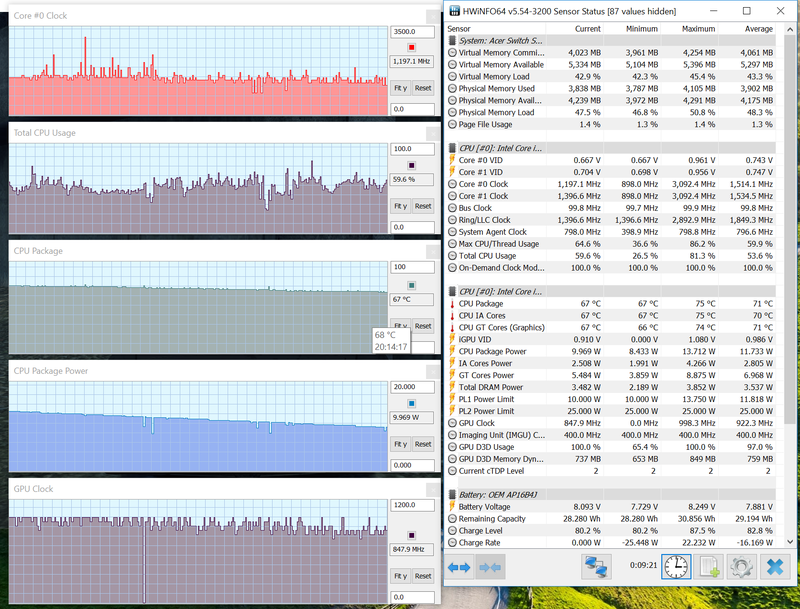 As mentioned multiple times during this article, the Switch 5 is passively cooled and uses Acer’s patented LiquidLoop cooling which seems to do a great job at keeping the i5 U processor at bay. 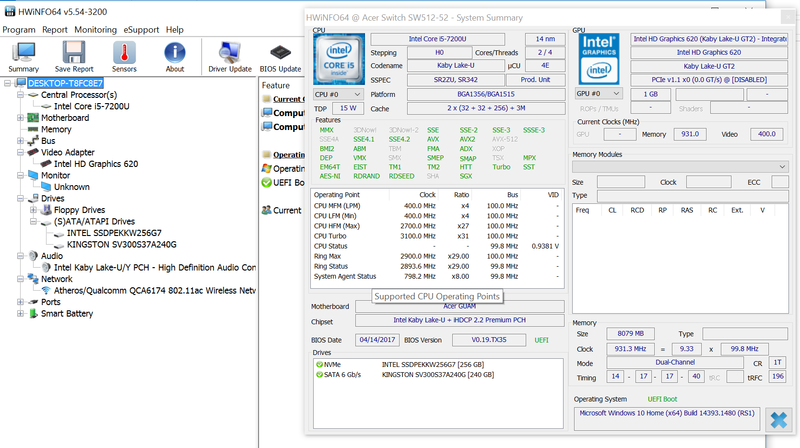 This computer doesn’t get any moving components inside either (like a HDD) and I didn’t notice any kind of electrical noise or whining on my sample, which means the Switch 5 runs perfectly quiet. 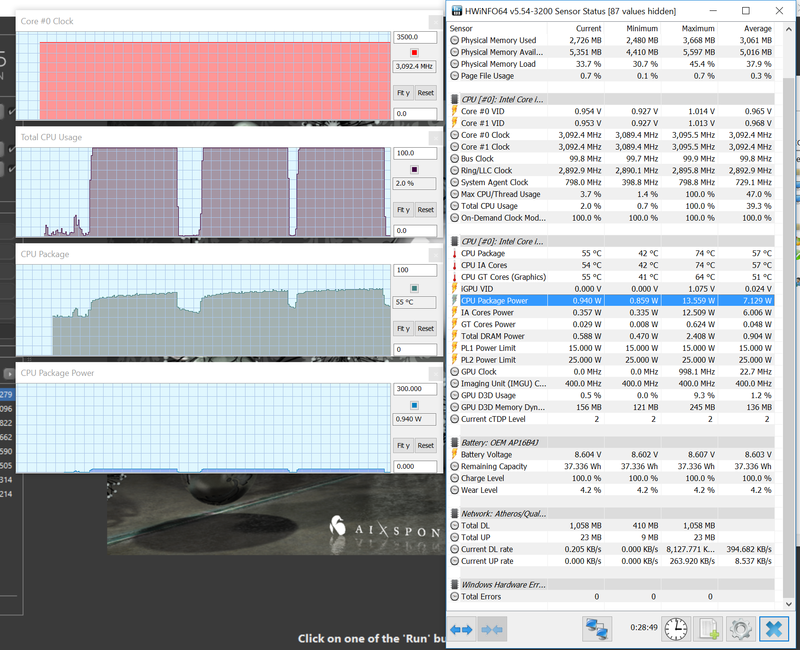 As far as temperatures go, the slate gets to about mid 30s with daily use and high 40s with gaming and benchmarks. 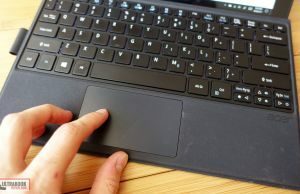 That’s hot, but you should keep in mind that all the components are placed behind the screen and as long as you’re using it as a laptop, you’re not going to perceive those temperatures as with a normal notebook that houses the components beneath the keyboard. 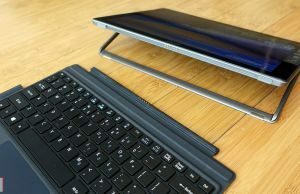 In fact, the keyboard folio stays at some very comfortable levels, usually under 30 degrees even on its top part where it attaches to the tablet. 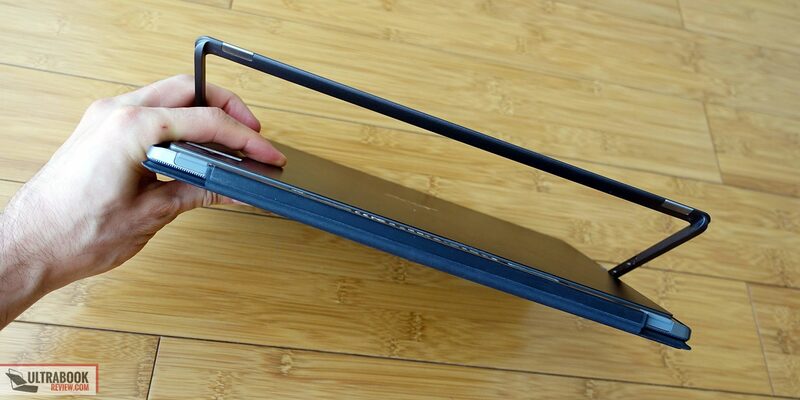 Performing demanding chores while holding it as a tablet on the other hand can quickly get uncomfortable. As far as connectivity goes, there’s Wireless AC and Bluetooth on this computer. Acer went with Qualcomm QCA6174 wireless module which performed while close to the router, but really struggled at 30 feet with 2 walls in between. I haven’t seen other people complain about this aspect though, so there’s a fair chance my unit encountered some drivers issues or just didn’t pair well with my setup. 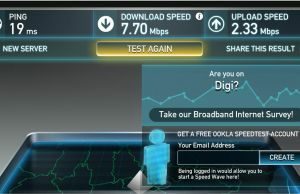 Regardless, poor wireless performance at longer ranges is something I’d look for and test if I were to get a Switch 5. The speakers are placed on top of the screen and face the user, something I appreciate. They’re not very loud though, we only measured top volumes of up to 76 dB at head level, and they’re also tinnier than I’d want, with lows noticeable only down to around 140 Hz. 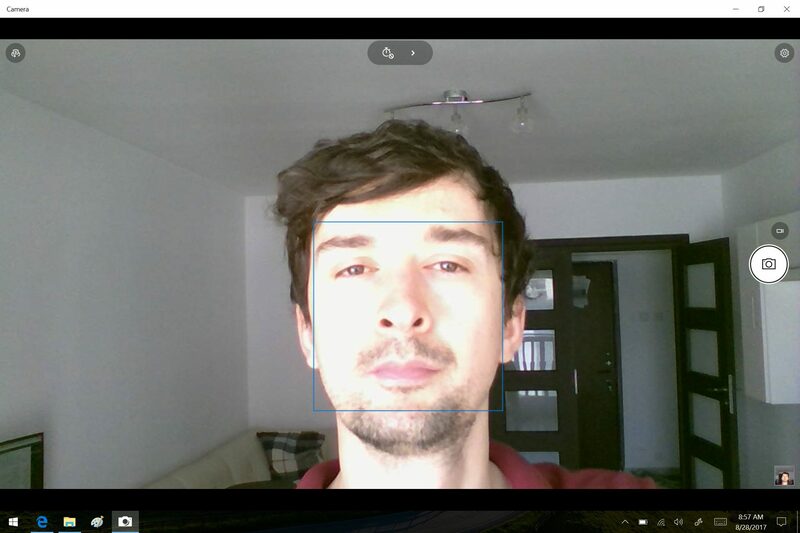 One last aspect to mention here is the webcam. It gets an HD sensor, is placed on top of the screen, where it should be, and takes some decent shots, but is nothing to brag about. There’s a 39 Wh battery on the Switch 5, which is a tad bigger than the battery on the Aspire 12 Alpha (37 Wh), but smaller than what the Surface Pro 5 offers (45 Wh). 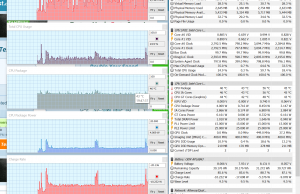 23 W (~1 h 30 min of use) – gaming on battery, High Performance Mode, screen at 30%, Wi-Fi ON. 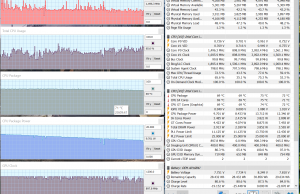 You’ll get a little shorter runtimes with the i7 configuration, in case you decide to opt for it. 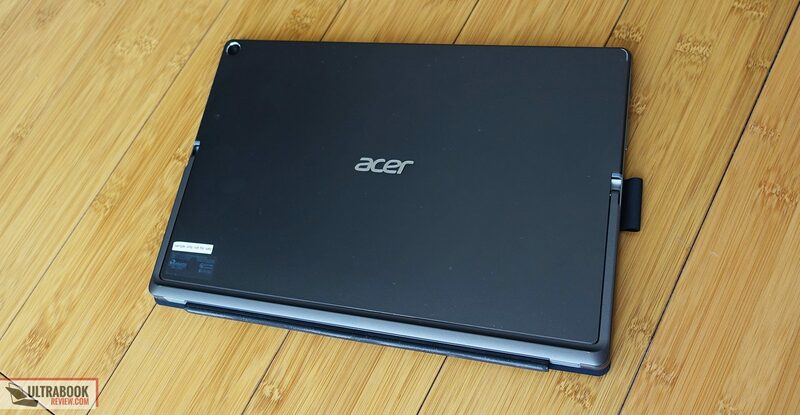 Acer pairs this laptop with a compact 45 Wh charger that weighs .155 kg/ .34 lbs (European Version). It lacks fast charging, and a full recharge takes a little under 2 hours. 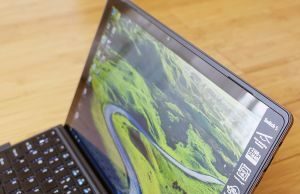 The Acer Switch 5 SW512-52 is available in most regions as of October 2017. 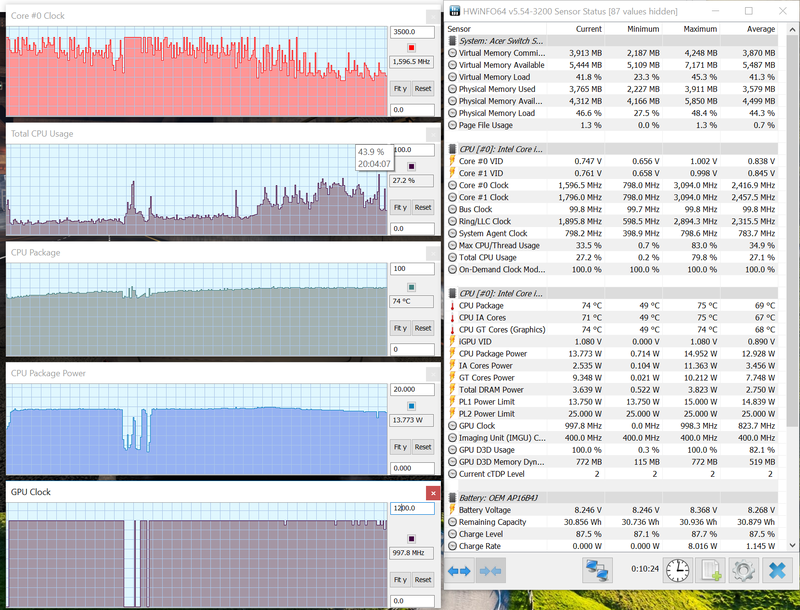 I find the best value in the Core i5-7200U configuration with 8 GB of RAM and 256 GB of SSD storage, which is listed for $799 in the US, with the pen and keyboard-folio included. 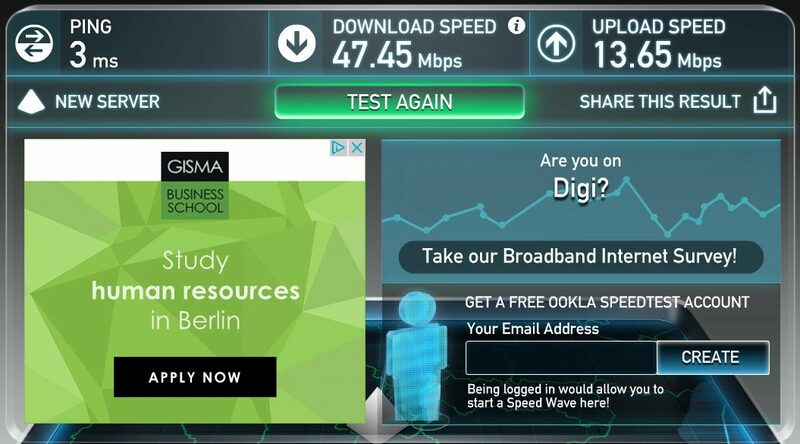 The same configuration is more expensive in Europe though, starting at 1000 EUR. 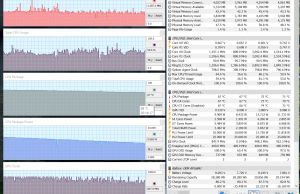 Expect to pay around $1100 in the US and 1300 EUR in Europe for the i7 / 8 GB RAM/ 512 GB SSD models. 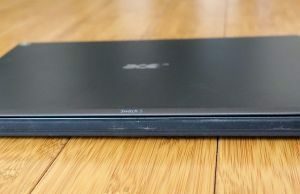 Acer Aspire 12 Alpha – Sells for around $750 for an i5 configuration, but with older hardware, smaller battery and crappier speakers. I would only consider it over the Switch 5 if heavily discounted. 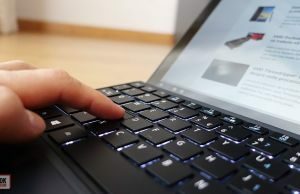 Microsoft Surface Pro 5 – a similar configuration sells for $1300 in the US and 1200 EUR in Europe without the keyboard and pen. This is a nicer tablet across the board, better built, with a much nicer screen, better speakers and larger battery. 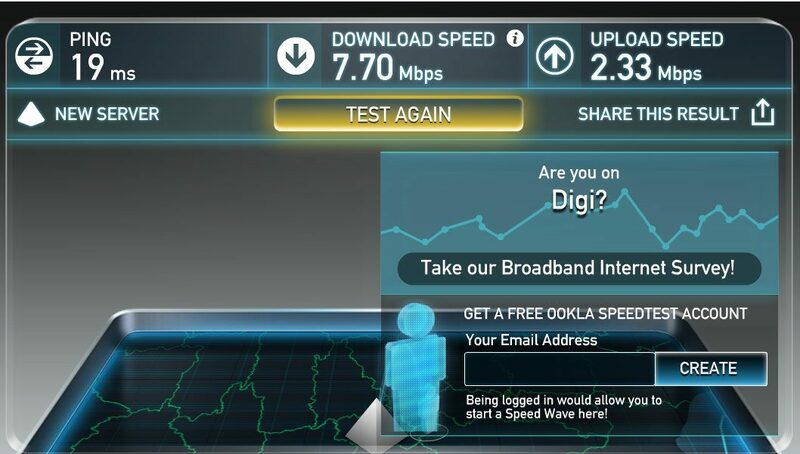 It doesn’t perform as well as the Switch 5 with demanding loads though and is much more expensive. 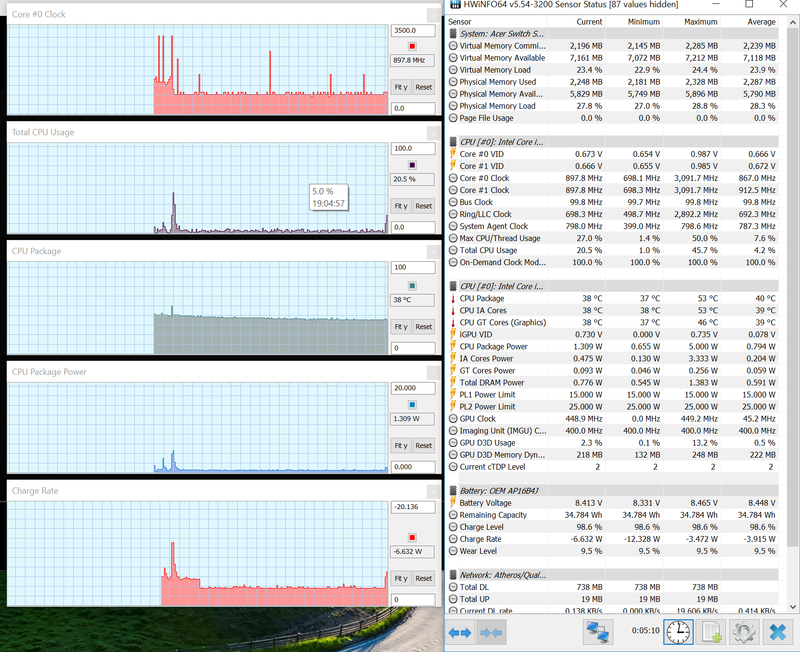 Also keep in mind that only the Core i5 models are fanless, the Core i7 configurations get a fan inside. 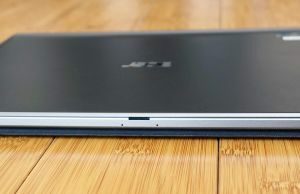 At the end of the day, if you’re in the market for a Windows tablet able to match the performance of most thin-and-light notebooks, while running completely silent, the Acer Switch 5 SW512-52 is one of the best options to consider. In fact, unless you have an unlimited budget, in which case the Microsoft Surface Pro 5 is the one for you, this Switch 5 is your best bet as of October 2017. 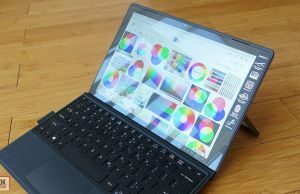 Your pool broadens as long as you can live with a fan inside your computer (Asus Transformer 3 Pro, Lenovo Miix 720, the 2017 HP Spectre X2 or the Dell Latitude 12 2-in-1), but I for one would rather pick one of these fanless devices. I’d personally aim for the i5 configuration of the Switch 5 which sells for $800 in the US and can handle everyday use very well and even tackle more demanding loads if needed, to some extent. You do have to understand that this is not the device to get if you’re after the best performer in a compact body. 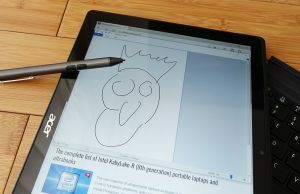 It is however the device to get if you prefer the tablet-like form factor with its compact design, reduced weight and the ability to take notes and draw with the included Active pen. On the other hand, the form-factor comes with some drawback, the important one being the smaller battery tucked inside. The Switch 5 is not bad as a laptop either, as long as you keep its mostly on a desk, with decent IO and a surprisingly good typing experience. 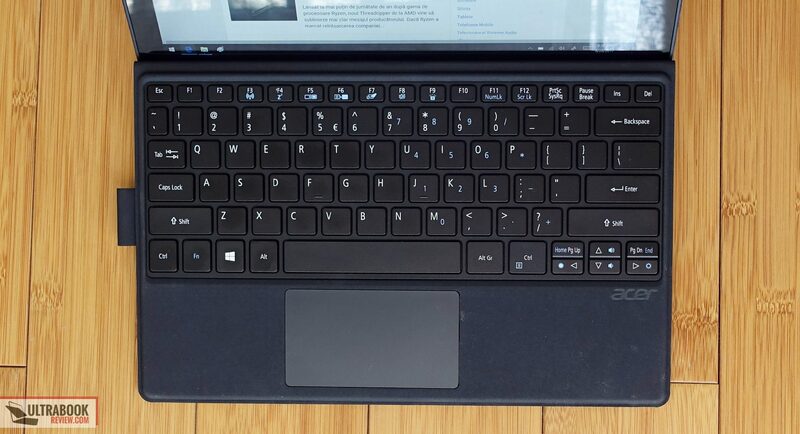 You will get improved versatility, improved performance and longer run-times in some of the clam-shell and convertible laptops out there. 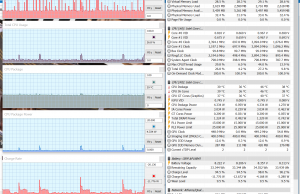 Very few of them are fanless though. 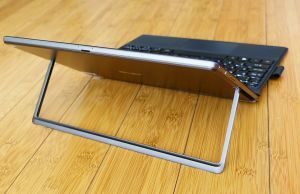 In summary, the Acer Switch 5 SW512-52 is a best-buy in its niche of Windows running tablets, with an excellent price and few quirks. Let us know what you think about it in the comments section below, and get in touch if you have anything to add to our impressions or any questions, we’re around and ready to help out. Hi You State "This screen includes a digitizer (made by ELAN, from what I can tell) as well and supports Acer improved Active Pen with 1024 levels of pressure sensitivity." 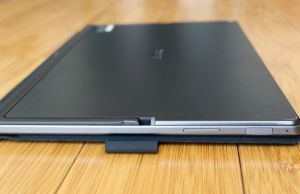 This is different from the Acer Switch 12 prior generation of pens, I was wondering If you knew if this newer pen would work as an upgrade for the Acer Switch 12 pen? 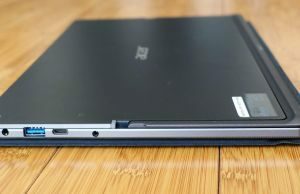 The model numbers suggest that this pen is the upgrade version of the pen the Acer Switch 12 uses and both are elan screens it seems reasonable that this newer pen would work on the older device. I don't know for sure, to be frank. It should, but I prefer to refrain from an answer without actually trying it. You should look for reviews of that pen on amazon and other shops/forums, see if others might have used it on the Switch. Mine gets around 70°C and the back is extremely hot to the touch. Is this normal? Arent those temperatures going to damage my switch 5? As an avid reader of this website, I deeply appreciate your effort and support to share such comprehensive insights. 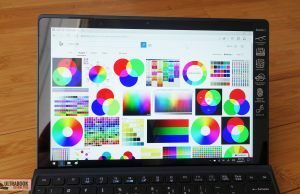 I am in a bit of a confusion about choosing a Ultrabook for my partner and in dire need of your expert advice. She requires a light weight ultra portable laptop/ 2 in 1 within a tight budget of $500 – $600 Max. 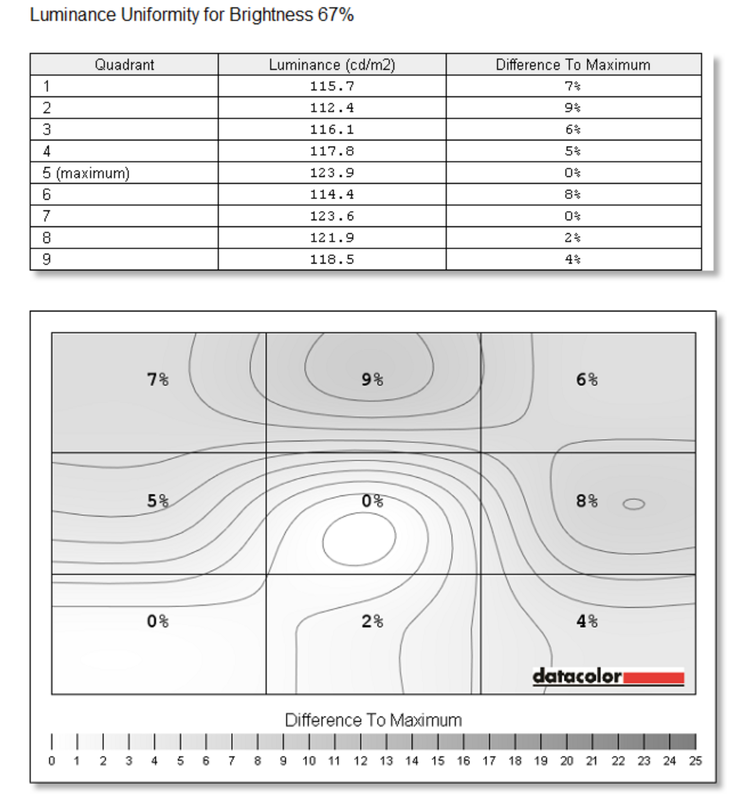 (budget and aesthetics matter to her) Screen preference 12" <-> 13.3" or max 14". Since this laptop will be travel friendly; portability, decent battery with slim form factor is the need of the hour. 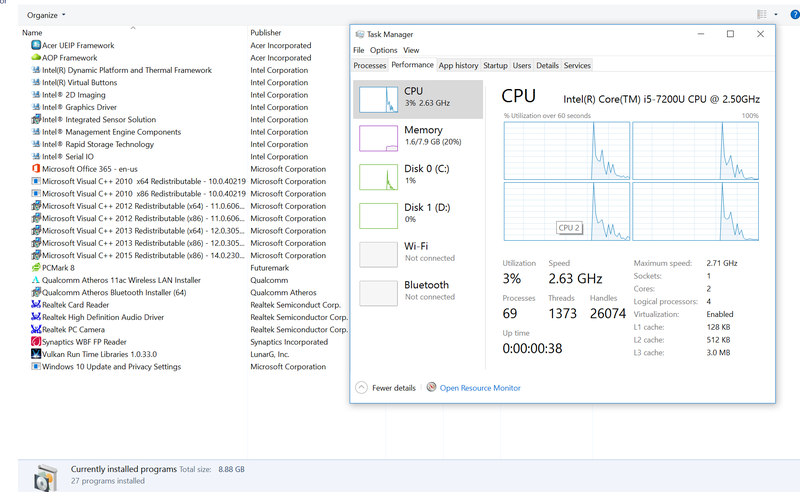 No need of high specs of Gaming at all, mostly used for 10-14 tabs browsing , Ms office (Word, PPT, Outlook) and movies etc, hence preferably i5 with 8 gb Ram and nothing above. 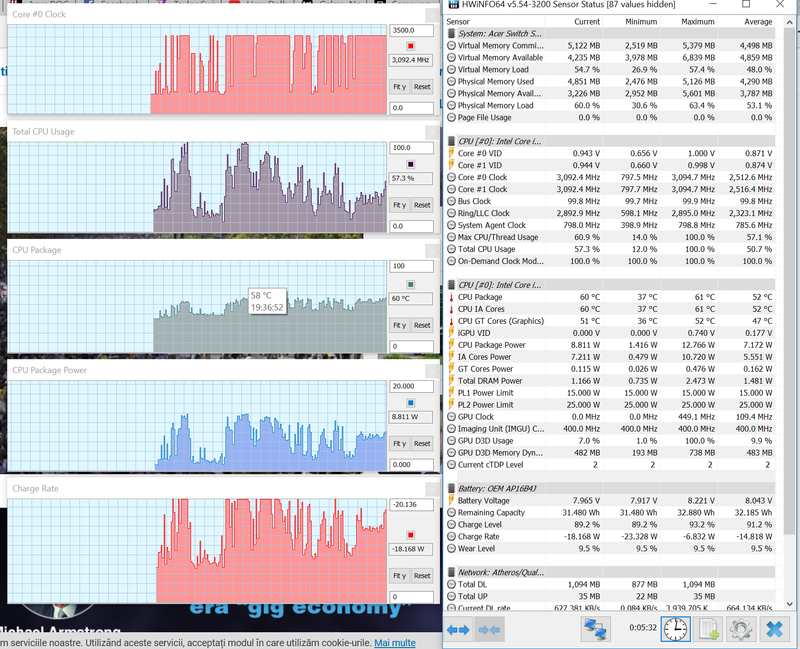 Although am assuming N4200 or M3 processors will not appreciate next 4-5 years OS updates/future ready. 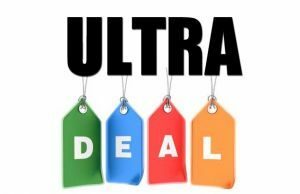 While I know $600 is super tight however I am evaluating laptops which are up till $800 but currently on offer/discount to match my budget. Please help me out as my partner is chasing me to finalize one. 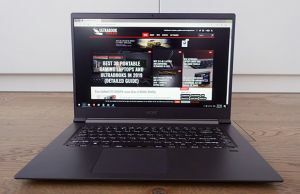 Few options reviewed and liked are Acer Switch Alpha 12 i5 6200U, Acer Switch 5 i5 7200U (on discount), Dell XPS 13 (over budget), Asus UX330 i5 7200U (over budget), Lenovo – Yoga 720 2-in-1 12.5" i5 (on discount). Also looked at Surface Go 8 GB ram. 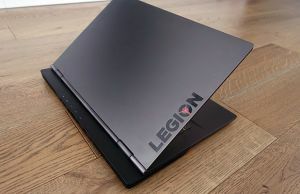 Lenovo IdeaPad ?? Please suggest either from above or something else. First of all, I'd aim at a Core i5 configuration (preferably 8th gen, but 7th gen should do), 8 GB of RAM and SSD storage if possible. 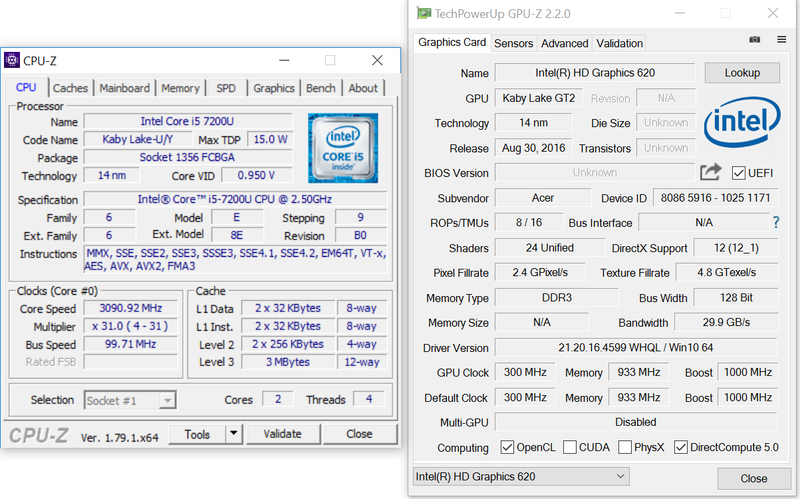 An 8th gen core i3 is also good enough, but I wouldn't go any lower. With that in mind, the options for clamshell laptops include the Acer Swift 3 SF314-52, HP ProBook 440 or the VivoBook S410. They're all 14-inchers, you'll hardly find 13-inchers around $600 (perhaps the Dell Inspiron 13/Latitude 13 and maybe some IdeaPads?). For 2in-1s you could look at the Dell Inspiron 13 5000 2-in-1, Dell latitude 13 3000, Lenovo Flex 5 or Acer Spin 3. It's hard to single out options, as I don't know how expensive these devices are in your country. Perhaps you can single out a few more options and then I can help narrow it down to a final pick.